Thanks to Lowndes County Agent Jake Price who did a good job coordinating Monday’s Satsuma Meeting. 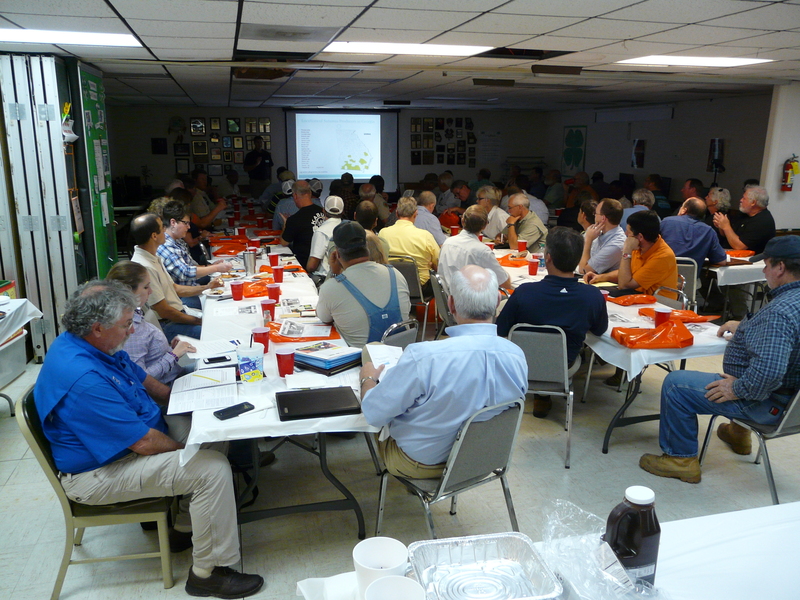 We talked about citrus greening, fungal disease, and fertility programs. We’re actually a few weeks past beginning bloom here, and with a warmer winter, we are seeing lots of terminal growth this year already. These trees are in their 2nd and 3rd year, and the fruit will not quite be tasty yet. Many of these blooms will actually be removed. Limbs of Owari grow outward, and many of the fruit can touch the ground with a younger tree. 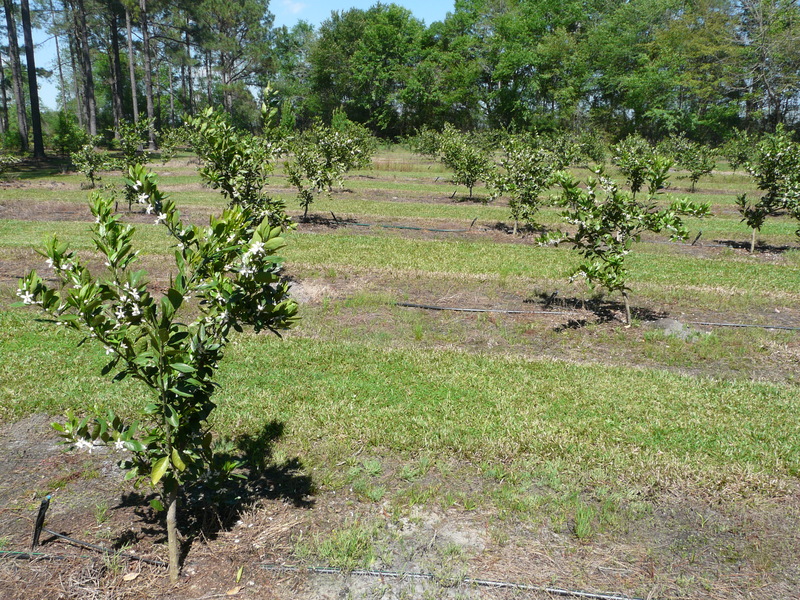 All of the varieties are self-fruitful, so no pollinizer trees are required. Bees may also help, but are not required. Our pH needs to around 6.0. A wider range is between 5.5 and 7.0. We need to lime if we are 5.5 or lower. 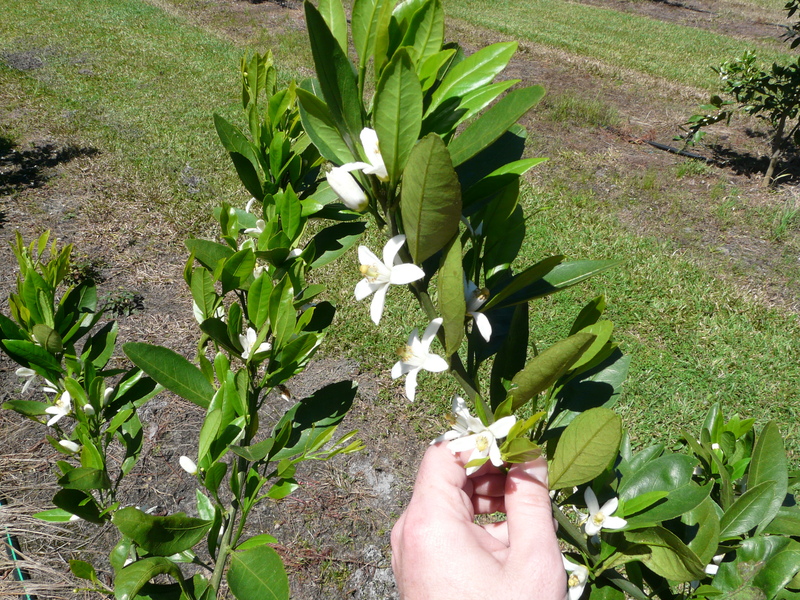 In this range, nutrients are most available for uptake for Satsuma. We don’t want to use fertilizer with N from September to mid-February since this could comprismise cold hardiness. 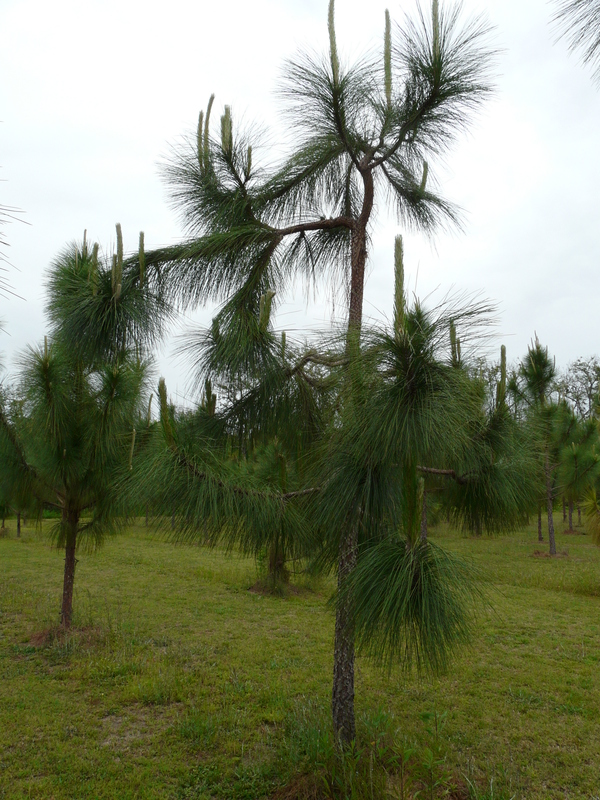 Here are some five year old long leaf pine trees where the terminals are bending or twisting awkwardly. This growth occurs when something physical breaks the terminal as they are young. Sometimes wind is to blame. There is also someone who noticed crows breaking terminals. You’ll notice in the picture how much growth by the new terminals. 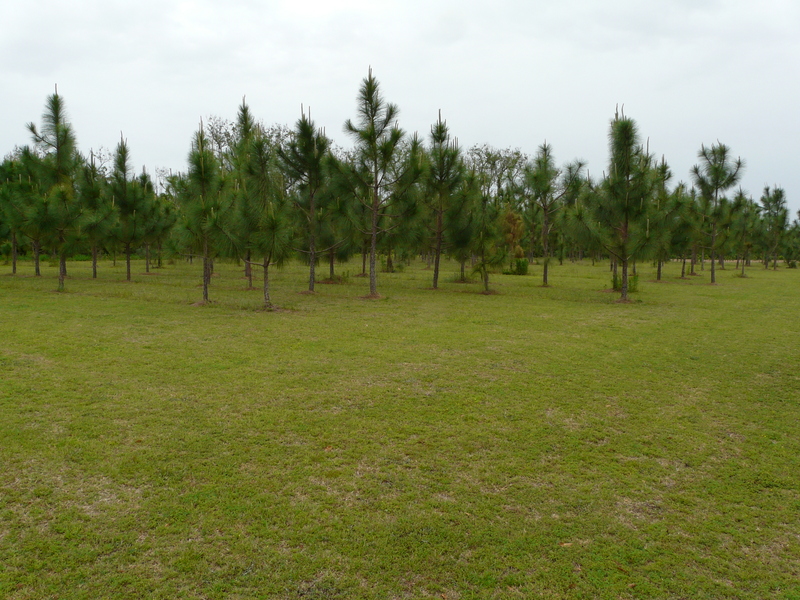 Since these pines were planted on the edge of a yard, sort of residential situation, they are getting more fertilizer from grass. They are also likely in a really good spot. 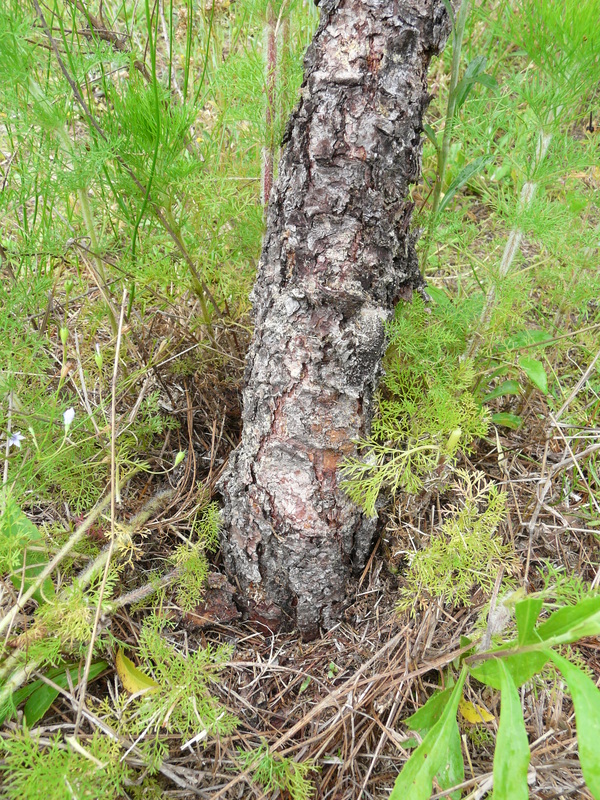 This extra growth also effects how these trees are bending. In this situation, you would not want to put any more fertilizer. 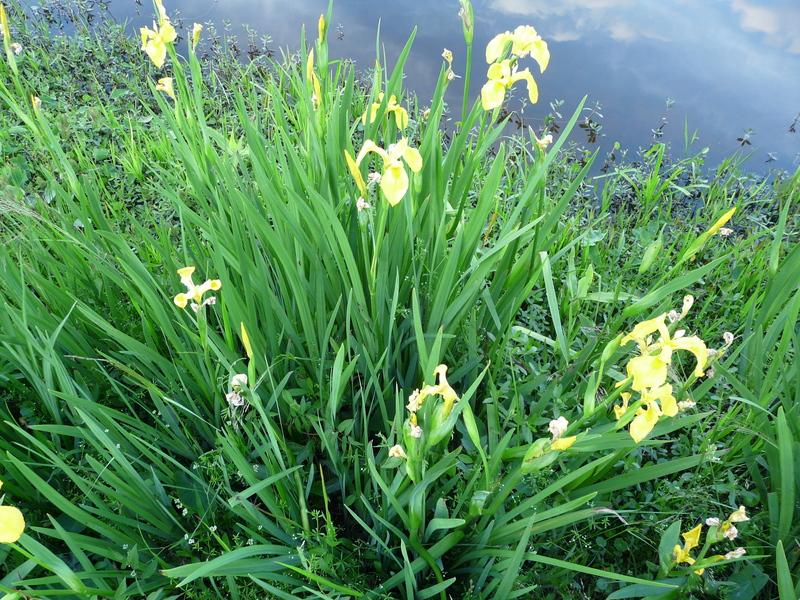 Here is a yellow flower thing growing by the pond I’ve never seen. 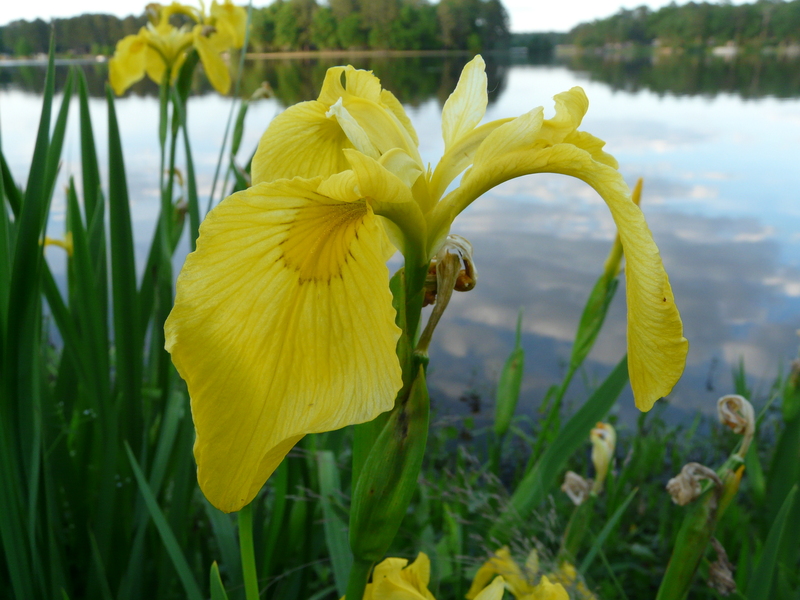 It turns out to be Yellow Iris (Iris pseudacorus). It’s an herbaceous perennial with stuff leaves. It reproduces by floating seed and rhizomes. 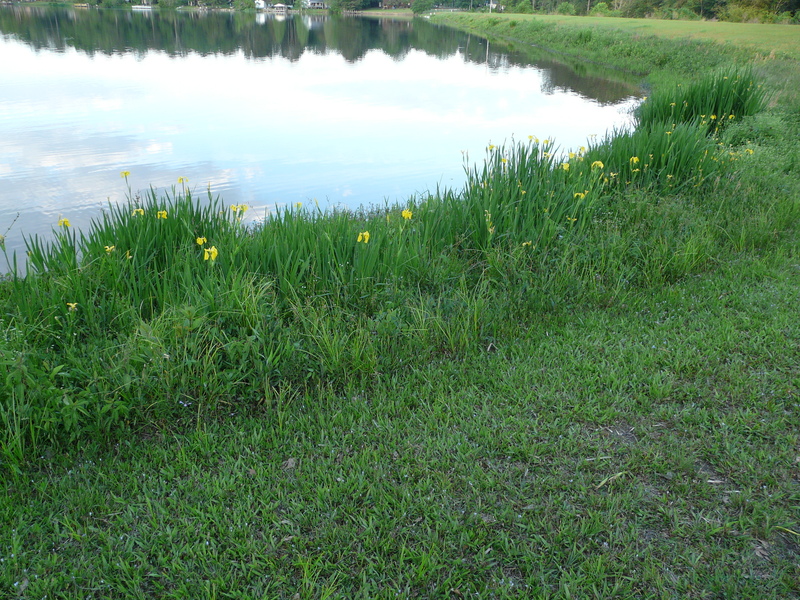 Up North, it is listed as a noxious weed, but UGA Extension Aquaculture Scientist Dr. Gary Burtle recommends leaving a margin of these plants along the shoreline to prevent erosion. The only thing we need to do is mow to leave a 3 to 5 ft strip. 1. Phorate (Thimet 20G) in furrow: Thimet has been around for a long time, and we have years (decades really) of data that show Thimet does a good job of reducing thrips injury, and that it can also reduce the incidence of tomato spotted wilt virus. Thimet is an organophosphate insecticide, and as with all pesticides, growers should read and follow label instructions carefully. Some phytotoxicity (aka “Thimet burn”) is commonly observed when Thimet is applied to peanut, but this injury has not been associated with lost productivity. The traps for our thrips flight monitoring program for 2016 will go out this week; we will begin posting weekly updates on this blog next week. 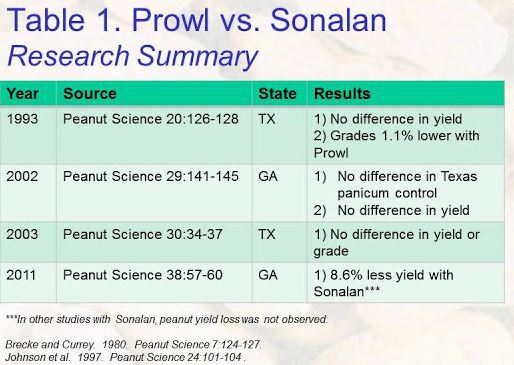 Here is an update from UGA Extension Peanut Weed Scientist Dr. Eric Prostko on Prowl and Sonalan. March was drier and warmer than normal across Georgia, ushering in projections for a warmer and wetter than normal spring. Warm conditions statewide caused early blooming of many trees and flowers, leading to very high pollen counts, which were not helped by the lack of rain needed to wash away the pollen. Early blooming in the northeastern part of the state led the National Weather Service to start issuing frost warnings there earlier than usual because of farmers’ concerns about the fruit trees. In spite of the cold weather in late March, most fruit trees across Georgia were not affected by frost, and a good and flavorful peach crop is expected this year unless a very late frost occurs in April. The lack of rainfall caused abnormally dry conditions across the state. This allowed farmers to get into the fields to plant and apply chemical, but dry conditions caused some concerns for germinating crops. Wet conditions in the southwest corner of the state hampered farmers’ ability to work in the fields and led to the development of some fungal diseases by the end of the month. The outlook for April does show colder temperatures in the beginning of the month, but a return to warmer conditions later. Precipitation is expected to be above normal for the first half of the month, but drier conditions may return in the last two weeks. Georgia saw well above normal temperatures in March, ranging from 3 to 6 degrees above the 1981-2010 average. the Valdosta, Georgia, average was 64.7 F, 4.6 degrees above normal. Multiple records for daytime high temperatures were set on March 15 across the state. Atlanta reported 85 F; Athens, 86 F; Alma, 87 F; and Columbus, 87 F, breaking the old records of 82 F, 85 F, 86 F and 86 F, respectively, all set in 2012. Macon also tied its record of 87 F on the same day, and Augusta, Savannah and Brunswick tied records on or near that date. Brunswick also broke a record high on March 14, recording 84 F, which surpassed the old record of 83 F set in 1975. Here is a field of triticale with a pathogen I have not seen before. I noticed these diamond-shaped lesions with a yellow border and dark brown spot in the center of lower leaves. It is called Tan Spot (Yellow leaf spot or Blotch) and is caused by Pyrenophora (Syn. Drechslera) spp. Disease development is favored by frequent rains and cool, cloudy, humid weather. I also noticed some of the leaf tips dying – this is also a symptom. 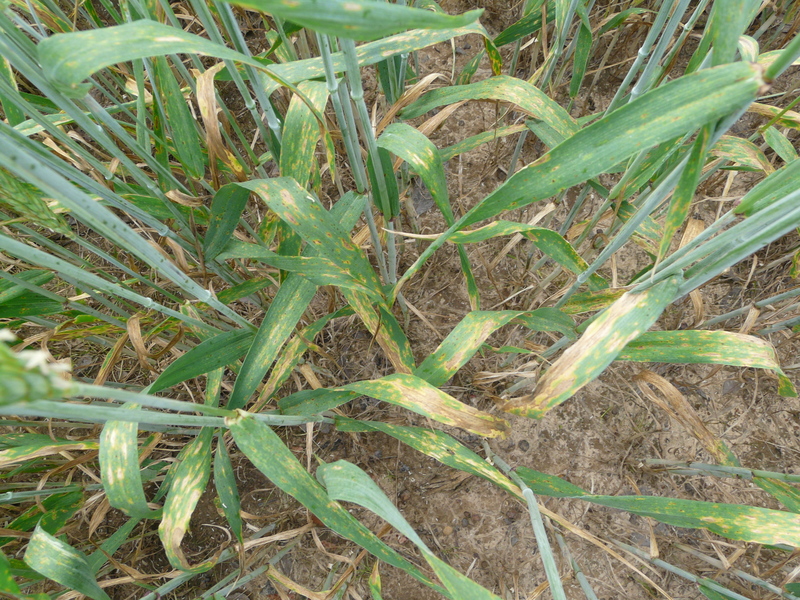 The disease is more problematic susceptible varieties, poor fertility and in fields with wheat residue left on soil surface. Initial infections come from diseased crop debris in the soil, or from diseased grass hosts. Usually the lower leaves are infected first, and the disease progresses to the upper leaves and leaf sheaths if conditions are favorable. This disease develops over a wide range of temperatures and is favored by long periods of dew or rain. Crop rotation with non-host crops reduces the severity of tan spot. Seed treatment seems to be effective in reducing the disease. Fungicides applied timely are effective in reducing the disease severity and improving yield. Most fungicides are label to be applied up to Feekes 10.5 (fully headed) but before flowering. Only a couple of triazol fungicides are labeled to be applied for Fusarium Head Blight at 10.5.1, which is flowering. Tan Spot can be serious by itself or it can contribute to other leaf spot complexes, like Stagnospora Glume Blotch, which we saw last year. 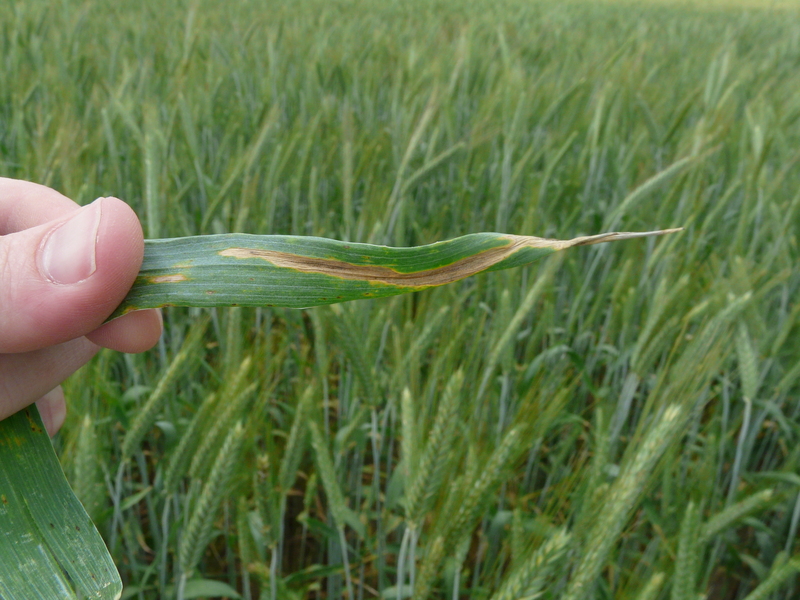 This field has already been treated with a fungicide, and the pathogen is not highly infected our flag leaf. This is the leaf below the head which is pulling most of the photosynthate to the grain. This is what we are aiming to protect.